After execution of this code, the figure uses only 33 colors from the colormap. I conclude that from n variable. And it distorts my colormap. Why is this happening? How can I perform full coloring with definied colormap? clc; % Clear the command window. workspace; % Make sure the workspace panel is showing. inputImage = imread('cameraman.tif'); % Gray scale demo image. imshow(rgbImage, 'ColorMap', map); % Will throw a warning saying you can't use a colormap on a RGB image. % which does not make sense. Is your input image RGB or gray scale, or indexed? You can see you're trying to get a colormap from an, essentially, indexed image in rgb2ind() instead of from an RGB image. It's RGB but it was created from an indexed process so there are just the number of colors that were in the colormap you applied. So when you use rgb2ind() to try to get back your original colormap, it will do that but it thinks it doesn't need 60 thousand colors and can use ony 36. It looks weird to you because there is no guarantee that the colors it comes up with will be in the same order. In fact, the order is all scrambled. Chances are the colors are in there just at a different index than you used. For example, you might say 100 should be red, but when it found red it might have said "Let's let red be at index 40" so it didn't pick the same indexes that you used, and that is why the colormap it came up with looks weird when plotted. Also, most monitors can't take more than 256 colors, not 60 thousand. Also in newer versions of MATLAB you need to use the word 'Colormap' when specifying the colormap, which you didn't do. ok, so input image is a gray scale image(uint8) which I want to colorize with color map that I definded as map. I understand that colors wont be in the same order. 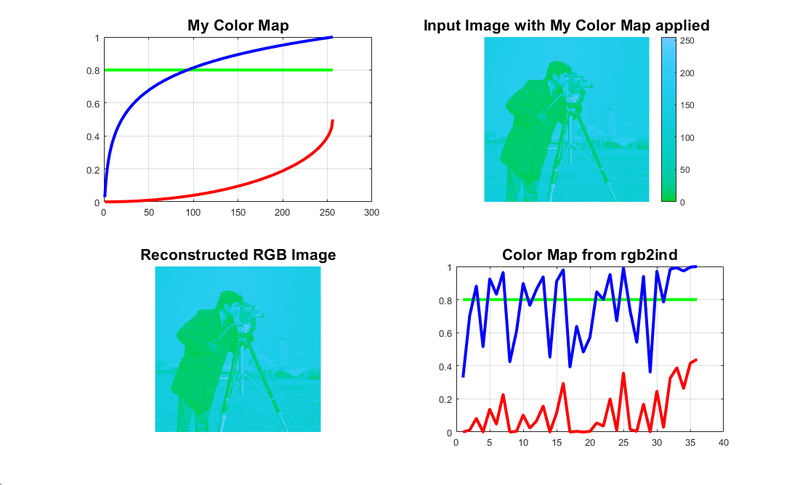 But I dont understand why if I define at the beginning a 256 colormap and try to apply it to the image. It uses only 33 colors, while there are 237 diffrent gray values to colorize in this specific image. I did attach the image to this post. It did use 256 colors to create the indexed image, and if you look at the 3-D color gamut with colorcloud() you should see 256 unique colors. It's just that when you tried to create an indexed image again from the RGB image, for some reason, it decided that only 36 colors were needed, not 60000 or 256. It's because of the algorithm it uses - Wu quant, or median cut, or whatever algorithm it uses. It's basically a clustering method and maybe some of the colors were so close together than it thought it could represent them with a single index. Like if 3 colors were really close to each other, it might decide that all 3 could be represented by (40, 38, 159) or whatever, and it assigned a single index to that color that represented all 3 colors. I think it's something like that.